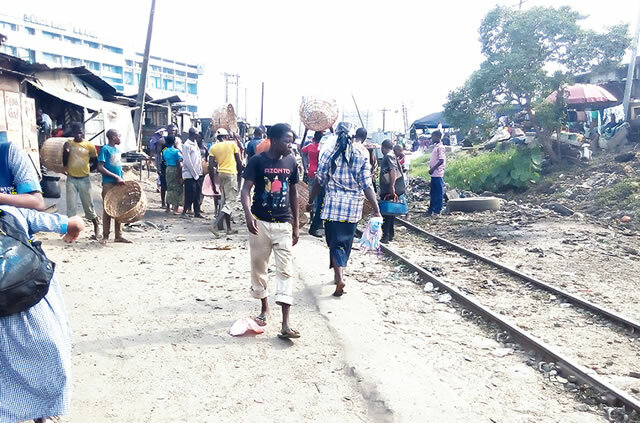 A deaf and dumb graduate, identified only as Ibrahim, has been killed by a train in the Oyingbo area of Lagos State. PUNCH Metro learnt that Ibrahim was walking along the track around 2pm on Tuesday when a train that just took off from the Iddo station crushed him to death. Residents said efforts to save the victim were abortive as he did not respond to alerts until it was too late.His body was said to have been cut into two, while his arms and legs were chopped off. When our correspondent got to the scene around 3pm, blood still dotted the spot where he was killed. A pair of shoes reportedly belonging to him were also seen in the area, while a crowd lamented the incident.His remains were said to have been moved into a commercial bus and covered with leaves and hard paper. “Ibrahim was a graduate of a university in Ibadan, Oyo State. He came to Lagos to work. He was deaf and dumb. “Around 2pm, after observing the Islamic prayer, we saw him walking beside the track; then he entered the main track. The train was said to have hit him, as residents watched in horror. PUNCH Metro learnt that some residents quickly mobilised and carried the corpse into the bus.It was learnt that the victim, who hailed from Ogun State, had recently lost a sibling. A vendor in the area, who did not identify himself, urged the authorities to find solution to the recurring train accidents in the area. The Police Public Relations Officer, SP Dolapo Badmos, confirmed the incident, adding that the Railway Police Command was investigating the case.